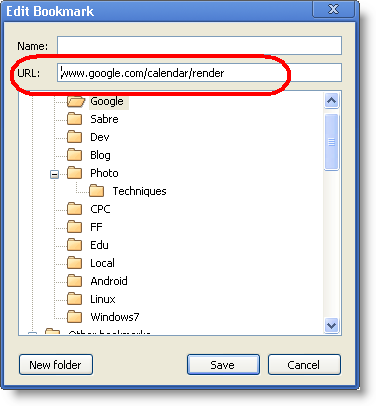 Ever wondered how to make a bookmark automatically and permanently open in a new tab by default? By just clicking the link without any additional keystrokes? One of the behaviors I've unconsciously stuck with is the ctrl-click to open bookmarks in a new tab. It's more efficient that clicking the new tab icon, then clicking the bookmark, or even hitting ctrl-t (new tab) first. I found it's easier to go right to the bookmark and ctrl-click and tada, new tab. Over time I've realized that I open most of my bookmarks in new tabs. Rarely am I in the middle of something in the browser and want to overwrite the page I'm on with bookmarked site. Poking around I found there is no setting in Chrome to set a particular bookmark to always open in a new tab. I want the efficiency of quickly left-clicking a bookmark like usual and having it open in a new tab without having to use the ctrl modifier key. 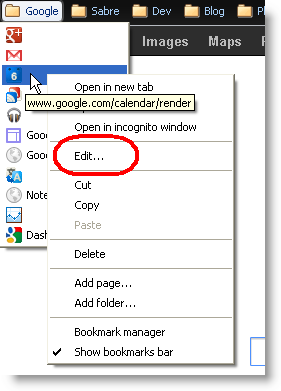 Right-click the bookmark you want to open in a new tab, then click "Edit"
This will bring up the "Edit Bookmark" window. The field you'll edit is the "URL" field. One key thing to remember is that the url must begin with the protocol, either http:// or https:// If the protocol is left out, the bookmark won't work. Then click the "Save" button and you're good to go. The video below will show the steps as well. As you probably noticed, I keep my bookmarks highly organized and visible in the bookmark bar so I have instant access to a large number of sites. I also typically remove the name of the site so that the favicon (the site's icon) is only displayed. Once I know what the site is, I usually don't need the name of it to know what bookmark I'm clicking on. Just like my computer, the icon is good enough and removing the name helps to keep the bookmarks very compact. You can fit a lot more on the screen w/o the names. If you want to do the same, when editing the bookmark as described above just delete the value in the Name: field. Leave it blank and click save.